A new consumer monitor shows that 45% of all the properties sold last year were bought with cash or savings. 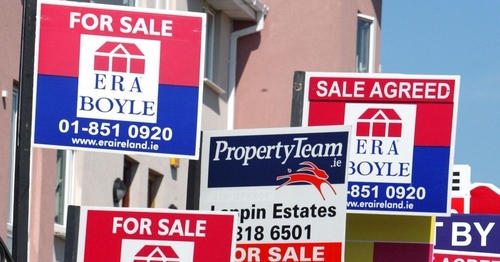 The latest quarterly Consumer Market Monitor, from the Marketing Institute of Ireland and UCD Michael Smurfit Graduate Business School, shows that 55,000 homes were purchased in 2018, an increase of 8% on 2017. The monitor reveals that almost 25,000 homes purchased with cash or savings last year, similar to the level of cash purchases made during the recession years of 2009 to 2013. While the residential property market is growing, the monitor said the number of homes bought last year was about half the amount purchased during the height of the last boom in 2005, when 105,000 homes were sold. It also shows an increase of 12% in the number of mortgages issued during 2018, with 30,629 drawn down. But that is a considerably lower level than during the last boom, with 85,000 mortgages issued in 2005 and similar levels in 2006 and 2007. The monitor also shows that while market growth was sluggish, demand remains high for housing in Ireland. Construction has picked up in recent years, with 15,000 new units built in 2017, 18,000 new units built in 2018 and another 20,000 and 23,000 new homes set to come on stream in 2019 and 2020 respectively. "However, based on the rate of new household formation, construction levels fall short of the number required to bring housing demand and supply into balance," the monitor said. "The CMM shows that there is a need for 350,000 extra housing units to meet demand over the next 10 years. This level of house-building would increase Ireland's total housing stock by 17.5% to 2.35 million units," it added. Professor Mary Lambkin, who authored the report, said the consumer economy is performing well in most areas, but the residential property market is still lagging behind. "The property market’s sluggish growth does not reflect the large increase in the working population and the rate of new household formation that has occurred over the past five years," she said. "While the number of homes for sale has increased to about 23,500, the level of property sales should be about double the current level, approaching the level that the market experienced during the early 2000s, when the workforce was about the same level as it is today," the Professor added. Tom Trainor, chief executive of the Marketing Institute of Ireland, said the outlook for 2019 is largely positive, with fundamental economic conditions remaining strong and likely to continue to drive employment and income growth. "The risk of a hard Brexit is weakening consumer confidence, in turn moderating the outlook for spending. But also, the mismatch between property supply and demand means home prices and rents are likely to outpace pay and will hit disposable income," Mr Trainor added.